Santana spent the first months of her life as a service dog in training, but she soon let us know that service dog work was too stressful for her and she would be much happier as a family pet. She was released from our program and adopted. Now she’s living the good life in her forever home. Similarly to the way people show preferences for certain careers, certain dogs are better suited to certain types of work. For example, a dog that tends to perk up its ears at sounds may be better suited to hearing work, while a dog that seems to pick up on people’s moods may be better suited to working with a child with autism. Dogs that really love smells may not be cut out for service dog work, but that same trait may make them perfect for detecting explosives. And other dogs would prefer not to work at all and instead become a family pet. Every time we release a dog from our program, we begin the search for the dog’s new forever home. Sometimes the puppy raiser chooses to adopt the dog, but other times, we need to find a new home. Would you like to adopt one of our released dogs? At any given time, we may have a few dogs that are looking for their forever homes. Since the dogs may be released at any time throughout their training, we may have dogs ranging 9-week-old puppies to 18-month-old dogs. Most of our dogs are labs. If you would like to welcome one of these dogs into your home as a new member of your family, please apply online. Turkey, stuffing, cranberry sauce, pumpkin pie… Who’s ready to celebrate Thanksgiving with friends and family? While you’re enjoying the good food and even better company, however, make sure you take a few moments to keep your dog safe this Thanksgiving. Here are a few tips so that your dog has a fun and safe holiday. Since you’re going to be indulging in foods that you don’t normally eat every day, it’s natural to want to share some of these special treats with your dog. However, while it may be okay to add a few small (boneless, fully cooked) pieces of turkey, sweet potatoes, or green beans to your dog’s dinner, be careful not to give your dog too much. Eating too much unfamiliar food can give your dog an upset stomach. And if you have an SSD dog, remember – no feeding from the table! A good idea to keep your dog occupied and give them a special holiday treat is to fill a Kong or empty marrow bone with pumpkin purée (not pumpkin pie filling), dog food, small pieces of turkey, sweet potatoes, and frozen green beans. Freeze this for a few hours before giving it to your dog. Not only is it a tasty treat, but it’ll take them a while to eat it. The following foods can be harmful to your dog. Please don’t feed them to him, or let your dog have access to them. We know you might be busy preparing the Thanksgiving meal, but please take some time to exercise or play with your dog before the festivities start. If your dog is already tired, she’ll be more likely to be calmer when your guests start arriving. Plus, she may even sleep through the meal! Although some dog owners remove their dog’s collar and ID tags when the dog is in the house, it’s a good idea to keep the collar on while guests are coming and going. In all the activity, your dog may slip out of the house, and you want to be sure that the dog can be easily identified and returned to you. Finally, make sure your dog has a quiet place to go if the festivities get to be too much for him. Our SSD dogs are crate trained, and our dogs will often retreat to their crate or their bed when they need some quiet time. SSD Queen Mab’s eyes drooped from her puppy massage at the start of puppy class, but once it was time to work, she snapped to attention. We always start our puppy classes with puppy massage. Puppy class can be very exciting for a dog because they get to see other dogs that they haven’t seen in a while. Puppy massage is a way to calm them down, resulting in a relaxed pup that can focus on the cues its puppy raiser gives it. “Fix” is useful when a dog gets tangled in the leash. On the cue “fix,” the dog will lift its paws until its legs aren’t tangled in the leash anymore. “Visit” is an excellent way to bring the dog closer to you, and it’s one of the cues that all of our dogs need to know. On cue, the dog puts its chin in a person’s hand or on their lap and holds it there for an indefinitely amount of time. Watch SSD Nook start to learn “visit.” Her puppy raiser clicks as soon as Nook’s chin hits her hand. When Nook experiments and tries jumping, her puppy raiser quickly moves her hand away. Watch SSD Queen Mab practice “visit.” Notice that when Mab wiggles her head around, her puppy raiser pulls her hand back, waits for Mab to settle, and then presents her hand again. Also notice that by the end of the video, her puppy raiser is asking for a visit by placing her open palm on her lap. This is the first step to getting Mab to do “visit” by putting her head on her puppy raiser’s lap without the hand signal. Next we practiced “back,” another cue that all of our dogs need to know. Our goal is to have the dog walk backwards in a straight line. To train this cue, we start with the dog in a chute so that the dog can only move backward. When the dog takes a step back, we click and treat. Gradually, we hold the click until the dog is taking more steps back. Once the dog is consistently walking backward, we move out of the chute to practice. Watch SSD Beaker take a few steps back while he’s in a chute. SSD Falstaff moves backward while his puppy raiser stands still at the front of the chute. SSD Honeydew loves the cue “back.” Watch her enthusiasm as she trots backward for her puppy raiser. We closed out the class with a game that we call “Puppy 911.” Our puppy raisers and dogs form two teams, each behind a bucket of water. Puppy raisers need to fill a cup with water and dump it in a bucket several feet away, all while their puppy walks on a loose leash. To add an extra challenge, puppy raisers had to hold the cup of water and the leash in the same hand. The Puppy 911 game is great experience for the dog because they get to practice loose leash walking in an exciting situation. And just think: If a puppy raiser can hold the leash and carry a cup of water with spilling, then that dog’s future partner will be able to hold the leash and carry a cup of coffee from the cashier to their table in a coffee shop. If you’ve been around dogs, you probably know that each dog has a distinct personality. A dog’s personality plays a large role in their success in our service dog program. Yesterday and today, the Country Capitals puppies and the Down Under puppies went through temperament testing. In the temperament test, we look at the characteristics of each puppy, based on the characteristics identified by Suzanne Clothier, a wonderful relationships-based dog trainer. This temperament test, plus our other observations of the puppies, helps us get a clear picture of each puppy’s personality. We’re able to identify whether a puppy will be successful in our program, and determine what type of puppy raiser home would be best for each puppy. For example, when Nancy, our director, was choosing a puppy to raise, she knew that she needed puppy who was extremely polite and understood dog behavior because that pup would be living at the kennel and growing up with lots of dogs with different personalities. When she saw these traits in SSD Meade, she knew that he would be the right puppy for her to raise. And now, almost two years later, we can see that Meade’s temperament test was extremely accurate. He’s a great dog that understands how to get along with other dogs. The puppy temperament test also helps us identify areas of training that our puppy raisers will need to work on right away. We’re very excited about these two litters of puppies! The Country Capitals and Down Under puppies will be joining their puppy raiser families on Friday evening, and then their real training begins! SSD Lucy is lucky number 13 for Sharon. Sharon is one of our veteran puppy raisers, who has had a hand in raising 13 dogs for us. 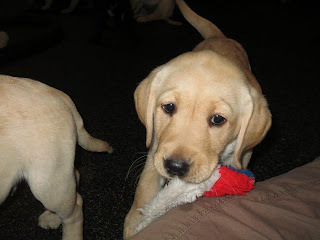 She recently shared her reasons for being a puppy raiser. The first dog I raised was a challenging experience. She challenged every request I asked of her. Although she didn’t make it in SSD’s program, she did become a drug enforcement dog, which was a perfect fit for her. However, I had such an exhausting experience with this first dog that I almost quit being a puppy raiser. When Nancy (SSD’s director) asked me to raise another puppy, I almost said no, but she brought the puppy along with her. How can you say no to a warm, wiggly puppy? I agreed, and this second dog sealed my fate in raising dogs for SSD. 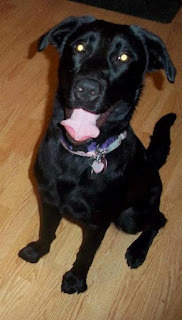 This dog, SSD Lily, was a sweet, smart, and wonderful dog. It was painful to send her to advanced training – what I call “puppy college” – because we loved her so much. But then we had the opportunity to meet Lily’s partner, and that pain turned to healing. The child who was paired with Lily was thrilled with her new dog, and we saw how much they needed each other. Several months after they were working together, the child’s mother called me and thanked me for giving her daughter a childhood. Before Lily, the girl was never able to get her toys out by herself. Now with Lily, the girl could get her toys out even when her mom told her not to – and her mom was so happy that her daughter could disobey for the first time, just like any other child! The girl and Lily also got in trouble for unwinding a roll of toilet paper. Her mom found them completely covered and giggling in the bathroom. The girl and Lily were a perfect pair. Her mom was so thankful that we made the sacrifice to give up this dog for her little girl. It still brings tears to my eyes, and it’s been about 15 years since we raised Lily! This is why I still raise puppies for SSD. Out of the 13 dogs I’ve raised, 7 have been placed as working dogs in SSD’s program, and of course, SSD Lucy is still in training. Each dog that was placed confirmed why I was giving up these wonderful dogs. Each time it leaves a hole, but the happiness of their partners helps fill it. I know beyond a shadow of a doubt that these dogs are completely loved and maybe even a bit spoiled by their partners. Would you like to be a puppy raiser and change lives? SSD has 28 puppies that are looking for puppy raisers. Raisers give the dog a home for 18-24 months and teach the dog the basic skills it will need to become a service dog. No experience is necessary! We will teach you everything you need to know. Apply online today to raise a puppy.